Last updated: Apr 1, 2019. 08:15 UTC. Looking for TMDHosting promo codes and coupons? #MasterTheWeb and save money today with our exclusive The Webmaster offers. Want to know more about this host? Check out my in-depth expert review here. This coupon gives up to 65% off shared hosting plans at TMD Hosting. Make the most of this offer by signing up for longer. This coupon gives up to 65% off cloud hosting plans at TMD Hosting. Make the most of this offer by signing up for longer. 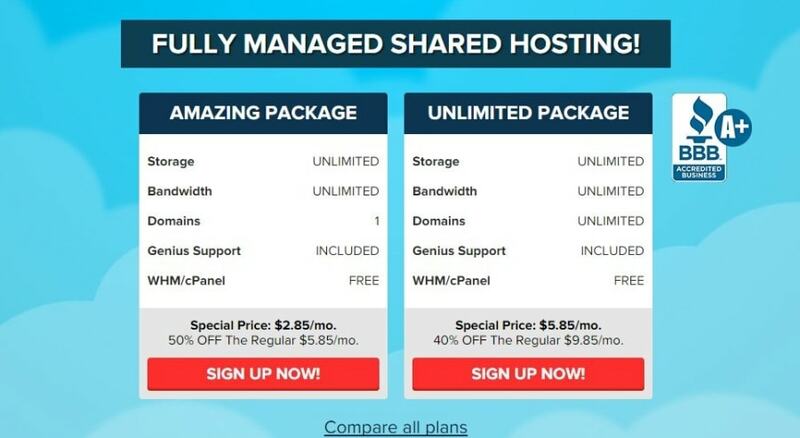 This coupon gives up to 65% off Managed WordPress hosting plans at TMD Hosting. Make the most of this offer by signing up for longer. 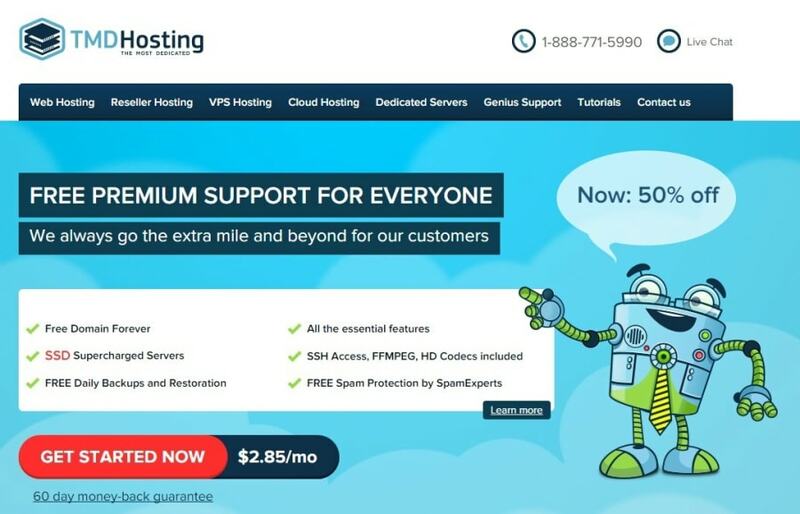 This coupon gives you 50% off your first month of VPS hosting. You can currently get $5 off per month all reseller hosting plans when paying annually, and $2 off per month for semiannual plans. You can currently get 50% off your first month of dedicated hosting. The Coupon above will open up a new browser window, and activate the relevant offers. You will clearly see the offer on the website as the discount will be showed in the pricing tables \ order form. In the example above, you can now click the “Get Started Now” button to choose between the two different Shared Web Hosting Plans. Click your chosen Coupon Code © The Webmaster. You will see on the next page, a choice between two plans. The first “Amazing Package” only allows one domain on the account, but gives the best discount. The second “Unlimited Package” allows unlimited domains. You can check all the differences between the two plans by clicking the “Compare all plans” link underneath the pricing tables. Once you have decided on your chosen plan, click “Sign Up Now”. Choose Your Web Hosting Plan © The Webmaster. You get a free domain name with all plans. You should be aware that the cost of any domain name is not covered by their 60 day money back guarantee. Furthermore, the amount withheld from your refund is $13.99 for .co.uk and .org.uk domains, and $19.99 for all others. This is more than the cost of the domains if you bought them separately at TMDHosting. If you are happy with the pricing \ convenience of having your domain located at your hosting provider then feel free to enter the domain you wish for free in the box shown. Otherwise, we recommend purchasing your domain via Namecheap. In our tutorial, we will use a domain we already have \ intend to buy elsewhere. Get Your Free Domain Name © The Webmaster. The next page covers steps 4, 5, 6 and 7 but we will deal with them under separate headings as there is a fair amount of information to cover. At the top of the page you will have the option to enter your account name, address, chosen password and method of payment. Payments can be made by Credit \ Debit card or PayPal. If you are an existing customer you may log in to link the new purchase to your account and save having to enter in your personal details again. You can sign up to Shared Web Hosting monthly, yearly, 2-yearly and 3-yearly plans. The best deal is for 3-yearly plans. Enter Billing Information © The Webmaster. Even thought we really like TMDHosting, we are a little frustrated at their Extra Services List, with particular reference to their Sitemap Generation, Google Webmaster Account and Site Verification and Google Analytics integration. These are very easy to implement for free yourself, especially if you use WordPress. Certainly, we would not recommend paying for them. Select any Extra Services © The Webmaster. While most of the offers are link activated, from time to time we will have limited time offers that require a promotional code. If applicable, you can enter that code here. Once you are happy with your order, accept the Terms of Service (you should always read this to check refund policy restrictions and usage restrictions (particularly relevant with “unlimited hosting”) and click “Checkout”. Enter your TMDHosting Promo Code (if any) & Checkout © The Webmaster. Can you advise which hosting plan I should choose? For shared hosting, the choice is simple. The Amazing Plan only allows one website to be hosted, whereas the Unlimited plan allows unlimited websites. As such it will depend on your requirements. Basically, both services are designed in order to combine some of the advantages of a stand-alone machine with the affordability of a shared solution. A cloud server is based on a network of servers and has the ability to exchange resources with the rest of the hosts of the network, to some extent, when needed. Thus a cloud server can handle efficiently sudden peaks in your resource usage, providing you with decent Burst RAM and CPU. On the other hand, a VPS (Virtual Private Server) is an isolated virtual container on a powerful physical machine that functions as a stand-alone server and can also handle medium to comparatively heavy projects in a custom environment. Well, the reason behind that is the difference in the technology behind those solutions. The VPS hosting solution simulates the work of a stand-alone server with all of it’s dedicated resources, whereas the Cloud solution dynamically allocates CPU resources between all the servers in the cloud. We asked them which service they would recommend for a blog with 2000 page views per day and they pointed us to their lowest priced VPS Plan. If you need further advice, we recommend speaking to them on live chat so they can advise the best solution. Yes, you can pay monthly. However, their monthly plans cost considerably more than their annual plans. We recommend paying for at least a year if at all possible to make the most of your TMDHosting coupons. What other billing cycles do they offer? They offer yearly, two-yearly and three-yearly plans. Do they offer a free domain? A free domain is offered with all hosting plans, however this includes only the most common domain extensions such as .com, .net, .org, .uk, .us, .biz or .info. Other domain extensions will incur an additional cost. If you exercise the right to refund, any free domain offered will be charged for at the prevailing rates (.i.e. deducted from the refund). I didn’t register a free domain on sign-up. Can I still get free domain? Yes, but only within seven days of when you purchased your hosting account. If I renew my services, will my free domain name be renewed? Yes, if your free domain was registered at sign up and is the primary domain active for that account. This is quite unique, as many hosting providers only provide the free domain for the first year. What types of payment can I use to pay? You can pay by Credit \ Debit Card or PayPal. Yes, you can pay for your hosting services using PayPal. They do not accept Bitcoin at this time. If paying by Bitcoin is essential, then we suggest Namecheap. Is there a money-back guarantee? If so how long? There is a 60-day money-back guarantee. Please note that any money back guarantee does not include add-ons, such as domain registrations or SSL certificates. These would be deducted from the refund. Can I use an SSL certificate that I purchased elsewhere? Yes, for $40 you can purchase a dedicated IP and third-party SSL Installation. This can be ordered from within the client area. Will my price go up when my hosting plan renews? If you have taken advantage of one of ou TMDHosting Coupons on your initial invoice, then yes, your hosting fee will increase on renewal. Can I renew my hosting before renewal? Yes, you can renew your hosting at any time by submitting a ticket to the billing department. Otherwise, you will receive an invoice two weeks prior to renewal which you can access via Client Area -> billing -> invoices.